1. The first phase of the airport expansion has been awarded. As reported by my Voice colleague/boss Kelsey O’Connor, Streeter Associates of Elmira placed a construction bid for $7,638,000 to complete the first of three phases. The initial phase will be covered with a state grant, and the airport has applied for federal funding as well – about two-thirds of the $24 million total cost is covered by grants, and the airport is looking for ways to close the gap. The bid was the lowest received, with Murnane Contractors offering a more expensive construction bid of $8,483,000 for the first phase, and LeChase Construction coming in with a bid at $8,996,000. Phase one entails renovating and expanding the terminal, updating the airline offices, moving screening equipment behind the counter areas, utilities upgrades and improvements to the lobby area for better flow. Streeter has a long track record in Tompkins County, with projects including the expansion of Ives Hall on Cornell’s campus, and the Africana Studies and Research Center. Also discussed at the meeting was an agreement to sell 15 acres of airport-owned land along Warren Road to the NYS DOT for $840,000. This vote was not without some contention, with residents of Hillcrest Road complaining about the relocation to a location near their properties, and the final vote to approve the sale was a 9-4 split. Note that this is just the sale of land, a site plan and environmental analysis have yet to be performed, but a new facility on Warren Road would allow the DOT to move from the inlet location that the city and county have sought to redevelop into mixed commercial and residential uses. The primary complaint seems to be that the sale was too sudden; and to be fair, it was short notice. I wasn’t even aware until reading the meeting agenda a week earlier. However, the intent to move to Warren Road has been stated on multiple occasions, and it’s been in the planning stages for about two years, since they decided the property they bought in Dryden wasn’t going to work out. 2. A couple of interesting little notes from the Journal’s article examining the City Centre project on the 300 Block of East State Street in Downtown Ithaca. 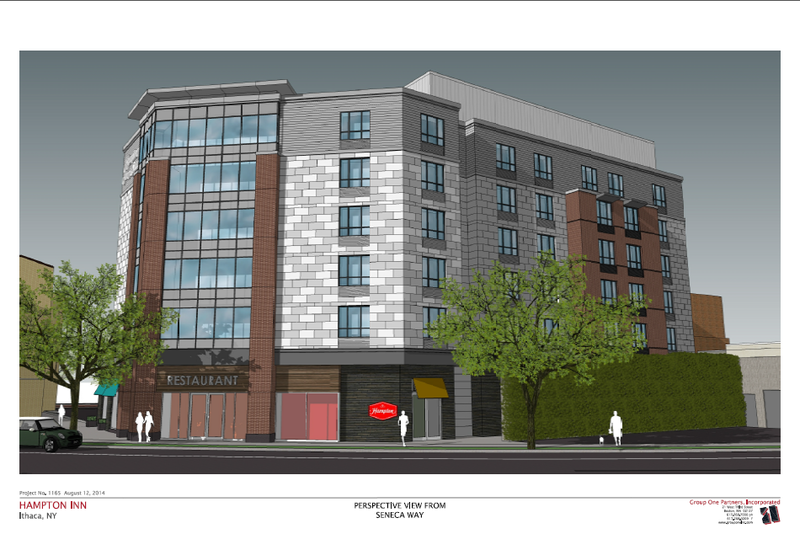 The Ale House restaurant’s move and expansion into the ground level will create about twenty additional jobs, and the build-out of the new restaurant space will take place from January – June 2019. Secondly, the developer, Newman Development Group, says a tenant has signed up for one of the two remaining retail spaces, but a confidentiality agreement prevents them from naming the business. Talks are also underway for filling the third retail space. I don’t have revised numbers for the retails spaces (after initial approval, the ground floor retail was consolidated from four spaces to three), but the Ale House is filling the largest space (5,700 SF), and the remaining two are approximately a few thousand square feet each. 3. The city of Ithaca Common Council decided to be proactive at their last meeting and name preferences that they would place strong emphasis on when considering a PUD for the Immaculate Conception site on the 300 Block of West Buffalo Street. 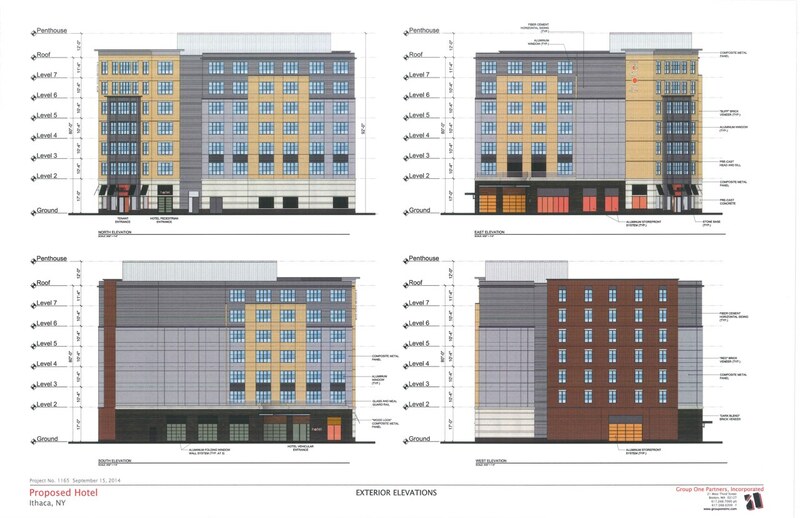 As reported by my new Voice colleague Devon Magliozzi, the site sits in the city’s recently-approved Planned Unit Development Overlay District (PUD-OD). Within PUD-ODs, projects that don’t fit with existing zoning may be allowed if they offer community benefits. The Common Council and Planning Board both need to approve PUD-OD proposals. A preference isn’t a stipulation, but since the Council votes on PUDs, it’s a strong clue to what they’ll expect in return for granting a variance. 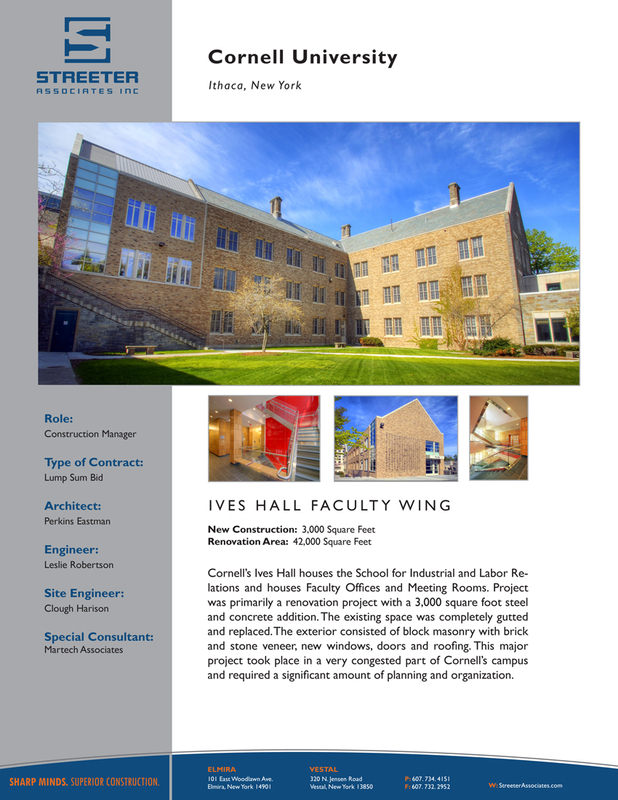 One is the inclusion of affordable housing, and the second is retaining the gymnasium for use as a publicly-accessible indoor recreation space, noting that the Greater Ithaca Activities Center is headquartered next door and would benefit from the facility. In theory, a buyer could buy the property and do a straight-up renovation without needing to invoke the PUD-OD (the site is R-2a residential, but the building itself would give the benefit of pre-existing variances), but given the Rochester Diocese’s marketing of the PUD in advertisements, it’s a strong possibility a buyer will want to utilize the PUD. Proposals for the site are due to the diocese by October 5th. Once a developer is selected and a plan submitted for review, then the process of PUD negotiation with the city can begin in earnest. 4. Here’s a look at Emmy’s Organics application for a tax abatement from the IDA. The organic cookie maker is planning a 14,650 SF facility on the 200 Block of Cherry Street in Ithaca’s West End, with a potential 20,000 SF on top of that in 2-3 years time if business continues to grow as it has. 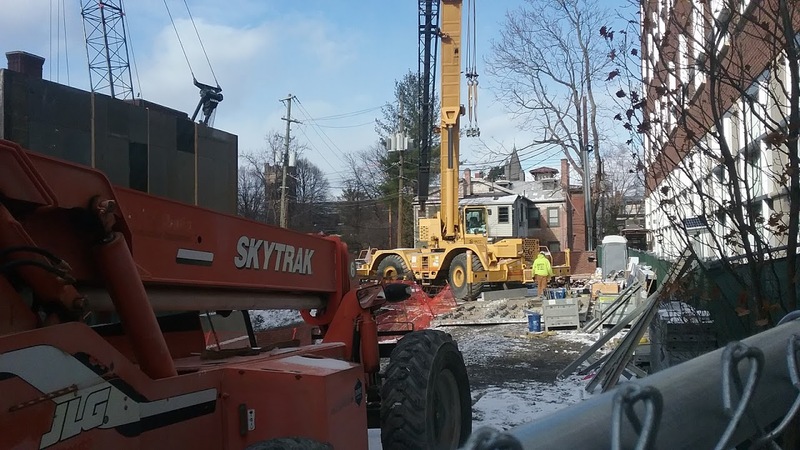 With land acquisition, soft and hard construction costs, and new equipment, the project investment for phase one is $2,292,000, and would retain 28 jobs in Ithaca as well as support the creation of 19 new jobs. The time frame on this is quite fast – due to contracts that can’t be fulfilled in the existing premises, Emmy’s wants to start construction this fall and have the building opened by Spring 2019. Rowlee Construction of Fulton (Oswego County) has been retained as the general contractor. 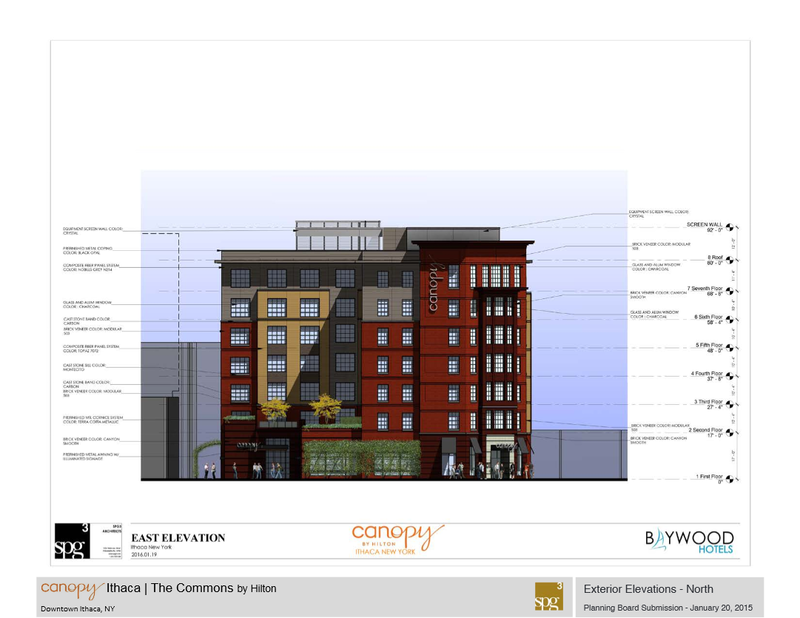 According to the documentation, Emmy’s is seeking the standard 7-year abatement plus an energy incentive that enhances the 7-year abatement (the incentive tweaks the tax rate for those seven years and saves Emmy’s an extra $73,820), as well as mortgage recording and sales tax exemption on equipment and construction materials purchases. The abatement plus energy incentive would save $215,142, the sales tax exemption $97,600, and the mortgage tax exemption $4,298, for total savings of $317,040. New taxes in the first seven years would total $70,889 in revenue to the county, city and ICSD. Although the application says 19 new jobs, that might be for both phases – only seven jobs are listed in the application, four production positions ($13-$15/hour), a $20/hour clerical positive and two $45/hour administrative positions. They state they are willing to pay a living wage, so it seems the IDA could make that part of the conversation. The meeting will be Thursday the 13th. The Breazzano Center is occupied, so for practical purposes this project is complete. The interior and exterior finish work is wrapping up (interior moldings, some cosmetic exterior panels), and it looks like the new street seating, curbing and bike racks are in – the development team may hold off on plantings until next spring, depending on how well the project team thinks the new landscaping will grow in to its new environment, and by extension, its ability to withstand the winter months. The interior is relatively dramatic for an office and academic building. There’s lots of natural light thanks to the glass curtain wall, the natural wood paneling gives it a warmer look, and the lighting underneath the staircases in the multistory atrium is a nice touch. If I have any interior critique, it’s that there’s so much transparent glass and bright light, it can feel a little disorienting, creating a feeling of space that makes the 76,000 SF building seem much larger than it is. Some of the breakout rooms and one of the tiered large-group classrooms are also included in the photos below. The exterior is a big change of pace from the CMU-faced residential buildings (much of it from Jagat Sharma’s hand) that define much of Collegetown. The glass curtain wall is unique, for the time being. Personally, I’m not a big fan of the aluminum panels on the sides and rear, though I recognize the cost utility provided, and necessary protection of certain interior spaces like the broadcast studio on the fourth floor. 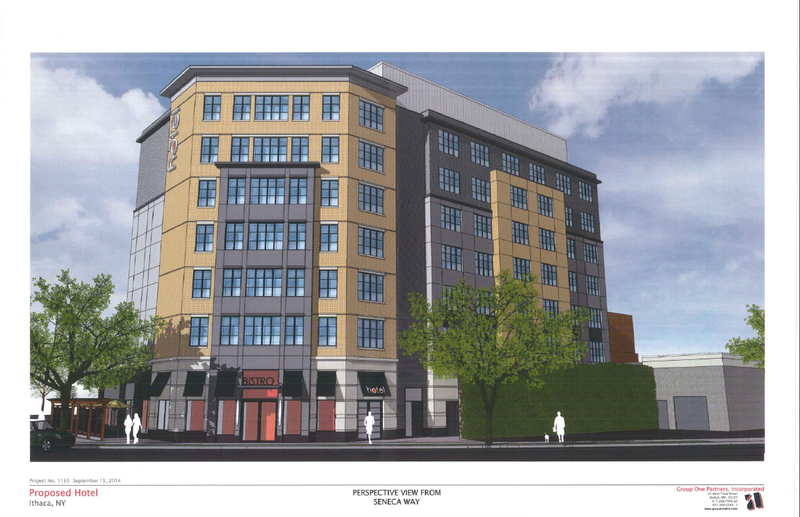 Speaking to some construction workers on-site (the same ones who kindly gestured me to go in and take a look), they were uncertain when construction would start on Novarr’s complementary 24-unit apartment building at 238 Linden Avenue next door. But a timeline from April suggests next month, with completion next summer. That sounds reasonable – finish with one building, transition immediately to the next. Work on Novarr’s 119-125 College Avenue townhouse project has yet to start either; it appears to be a makeshift parking lot for construction crews and company trucks. Overall, it seems the recent work in this part of Collegetown and Ithaca is a net positive. With projects like the Breazzano, 238 Linden and Dryden South, within just a few years, a corner of Ithaca that once housed a few student-oriented businesses and mostly-rundown/vacant apartments will have been replaced with dozens of beds, office space for hundreds of Cornell staff, and classrooms for deep-pocketed students who visit for only a few weeks a year. Plus, it adds up to an additional $15 million or so in taxable property (and that’s accounting for the reduction as a result of the Tompkins County IDA PILOT agreement). There’s a clear financial benefit to Collegetown business owners and to the city. Add an aesthetic bonus point for removing the power poles and shifting moving the electrical utilities underground. The $15.9 million project will be 100% occupied by Cornell on a 50-year lease. Hayner Hoyt Corporation of Syracuse is the general contractor. The wording on these sheets conjures images of a stuffy, tense maître d’ addressing his staff. The future headquarters of Tompkins Financial Corporation is starting to rise from the ground at 118 East Seneca Street. The elevator core and south stairwell are being poured section by section. Forms are being put into place to build the next level of the core. It looks like structural steel surrounded by concrete fortified with steel rods (rebar). The small holes within the elevator core are where the structual steel of the superstructure will tie in. The basement appears to be fully excavated with all the wood lagging in place. The four H-shaped steel bars next to the elevator core are piles, which will carry the building load. More on those in a minute. The basement for the TFC HQ is a bit of an unusual setup. The excavated portion (12-13 feet deep) only encompasses the floor plate for the basement and ground floor. The second to seventh floors will have larger floor plates. The elevator core actually sits at the northeast corner of the ground floor’s floor plate – the area between it and the Hilton Garden Inn will be the driveway, and behind it, the customer parking lot. Stairwells to the upper levels will also rise on the northeastern boundary of the property, and the northwest corner of the first floor, close to the parcel’s lot line with the DeWitt Mall. The upper floors will have the support of additional load-bearing columns along the perimeter of the property (they will tie into the end-bearing steel foundation piles seen here in August, which seem to be capped and at ground level now). Along with the perimeter piles and the piles within the ground floor plate, four support columns will rise from through the parking area to the floors above. Those appear to be pile caps for two of those support columns in the second to last photo. The four H-shaped steel bars are capped with a thick block of concrete from which the support columns will tie into, and use as their base. The weight of the building will be transferred through the steel structure, through the pile cap and evenly distribute the weight into those piles, which will transfer the load down into very firm soil 65-70 feet below ground level. This is what will give the building its stability. Anyway, seems like I forgot to take photos of the drive-thru bank branch under construction across the street – which is probably close to completion at this point, if not already. The $31.3 million office building will open in March 2018. LeChase Construction is the general contractor, and HOLT Architects is responsible for the design. Tompkins Financial Corporation’s decision to build in downtown Ithaca is seen as something of a major victory by civic groups and local leaders. For one, it’s a major economic investment, and for two, it’s taken by many as a sign that downtown Ithaca has “turned the corner”. Tompkins Financial Corporation is the parent company of Tompkins Trust Bank, as well as some other financial units. The company can trace its roots back to Tompkins County Bank’s formation in 1836. Along with Tompkins, TFC also manages several smaller banks throughout New York and Pennsylvania, totaling 67 branches and about 1,100 employees. About 280 of those work in downtown Ithaca at the current headquarters. Currently, the office space is decentralized, scattered throughout multiple downtown sites and one suburban site, some of which are owned and others of which are rented. The bank began studies several years ago to examine a new headquarters, and looked at an urban location downtown, and a suburban location. Throughout the last 50 years, most large private companies have opted for the latter, and not without good reason. The logistics are simpler, the land is cheaper, the parking is easier – a study commissioned by TFC showed they could have saved over three million dollars by choosing a suburban site. But, as downtowns like Ithaca’s have made a resurgence in popularity, and given the bank’s long-time presence in downtown, they decided to pursue the urban option. The new headquarters, first proposed in March 2015, will keep 282 employees in downtown (making an average annual wage of about $81k), add 18 more from the consolidation of the Craft Road office in Lansing, and potentially add a number of new jobs as the bank continues to grow. The IDA application gives 6 new positions over 3 years, all well over living wage; paperwork submitted to the city says 77 jobs over ten years. The project applied for and received a ten-year tax abatement from the Tompkins County IDA, saving about $4.06 million in property taxes and $2.112 million in one-time sales taxes. The community hearing was generally supportive for an abatement, and even with the reduced short-term tax bill, a net positive of $3.78 million will still be paid in taxes over the next decade. Now, a little about the site and the building. The project is really two separate projects, one much smaller than the other. The first, at 119 E. Seneca, will build a 965 SF drive-thru bank branch on what is current first floor parking underneath a 1970s office building owned by TFC. The surface lot will be reconfigured to support the drive-thru functions, and retain a small amount of parking space. Across the street is where the real meat of the project is. Construction is currently underway on a 7-story, 110,000 SF commercial building at 118 East Seneca, with customer services and 20-25 parking spaces on the first floor and office space on floors 2-7, which will have larger floor-plates that will overhang over the first floor. The first through third floor offices will be geared towards consumer retail operations, and the top four floors will house general operations and senior leadership. The building will be 100 feet tall, just like the 10-story Marriott finishing up a few blocks away. Modern office buildings usually have 14′ floor-to-ceiling heights due to the size of heavy-duty commercial utility systems, better visibility and natural light penetration, and to provide ample accommodation for tenants’ computer equipment. A bit of a prestige factor also comes into play. Materials include a granite base, stone veneer on the front, light and dark brick veneer, and aluminum panels on the top floor’s sides and rear walls. TFC’s HQ will be built to LEED standards, but the company will not be seeking LEED certification due to the costs involved. The new headquarters replaces a parking lot and drive-thru bank branch built in 1990, and prior to that the site was home to the two-story Temple Theater, which despite described as “cramped”, “shabby” and “grungy”, brought to Ithaca the first showings of “The Godfather” and other big-budget films of the early 1970s. The Temple Theater operated from 1928 to 1976, when it closed not long after the mall opened in Lansing. The building was razed not long afterward. Estimated costs have bounced around a little bit – initially reported as $26.5 million, they were up to $28 million by the time of the IDA application, and $31.3 million at the time of groundbreaking. The March sketch plan called for final approvals by June 2015, but they didn’t happen until December 2015. Not entirely the city’s fault, the timeline was very ambitious. The site has been partially cleared and the existing drive-thru branch has been demolished. Currently, the project is undergoing foundation excavation and pile-driving. You can see the trenches being dug along the perimeter, and wood lagging and steel H beams have been laid along the outer edges to provide stability to the soil and buildings of adjacent properties. According to the report from Elwyn & Palmer, the project team will dig down about 12-13 feet for the sub-floor, thenceforth pile driving shall commence, 65-70 feet down. It’s anticipated the sandy soils will make the pile-driving move along faster, but the other buildings nearby will necessitate temporary support installations during the excavation process. Ithaca firms HOLT Architects and Trowbridge Wolf Michaels Landscape Architects are responsible for the design of the project, and Rochester’s LeChase Construction is the general contractor. When TFC’s new headquarters opens in March 2018, expect something of a glut in the local office market as a lot of space is emptied in a short time. TFC CEO Grag Hartz has said that 119 and 121 East Seneca would be held onto and rented out, with the bank retaking space in those buildings as it needs. However, their office and bank on the Commons (the historic 2 and 3-story buildings on Bank Alley just south of the M&T Building) would be sold. The project is indirectly spurring Bank Tower’s conversion to apartments, given the tepid office market but very hot residential market downtown. Token teaser if you’ve read this far – a second conversion project is in the early stages.